This is author/illustrator Brendan Wenzel’s debut picture book, and it’s made a major splash - think a bidding war, a New York Times bestseller list spot (in the picture books top 10), and rave reviews from all over. A cat ‘walked through the world’, and is viewed very differently by the animals (and child) it encounters. 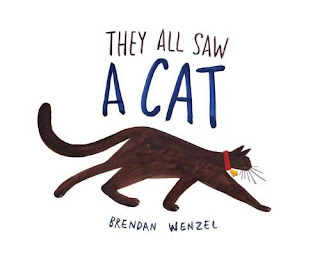 A fascinating exploration of perception, it reveals through vibrant illustrations the way in which creatures like a bird, a bee, a mouse and a flea view the cat. We see a terrifying demon-like cat through the eyes of the mouse, and an endless forest of cat hair via the flea. The wildly different takes on the cat opens up ideas around how we see others, how they might view us, and how everyone’s unique experiences shape the way they see the world. Rhythm and repetition are used to great effect, and the illustrations are nothing short of stunning. The cover, with its effective use of white space and simple yet striking cat image (with a glossy contrast) is pure picture book eye candy. The text is deceptively simple at times, with layers of meaning able to be extracted and contemplated, the greater the age of the reader. A captivating book destined to become a classic.